We're on the verge of the biggest conference realignment in the history of college sports, but if it happens ... will it still be college sports? Or just pro football that happens to take place near schools? As best we can tell, here's the situation right now: The Pac-10 is prepared to offer the whole Big 12 South a spot in their new 16-team mega-conference. (However, they might snub Baylor and take Colorado as their sixth team instead, but that wouldn't sit well with Texas state legislators who want to keep their four major schools together. They might try to block any deal that includes the Buffalos and not the Bears.) Texas, being the biggest and baddest school in the country, would prefer to stay where they are, but they also see the writing on the wall and are prepared to do what they need to if Missouri and Nebraska choose to join the Big Ten. 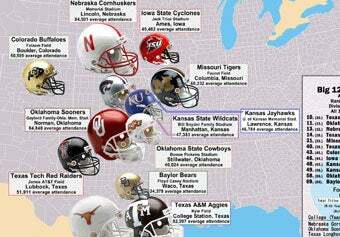 Missouri would do anything to join that other conference, but nobody in the Big 12 is gonna lose sleep if they leave (hello, TCU) so a Longhorn move really depends on what Nebraska does—but their move depends on what Notre Dame does, because the Big Ten really, really wants the Irish, but Notre Dame won't go to a 16-team league. They will only join the Big Ten if expansion stops with them, which the Big Ten may be willing to accept, because that still gives them an in at NBC, which could potentially be more lucrative than getting the Big Ten Network on the air in Texas, which will happen either way because Notre Dame still has a national reach. So really it all comes down to Notre Dame—natch—because if they go to the Big 10, then the Big 12 might somehow hold together, but if they turn them down, then Jim Delany will go all in and divide the rest of Big East (the best reason of all for Notre Dame to accept) and take Missouri and Nebraska from the Big 12, which will force Texas to join the Pac-10—though the Big Ten wouldn't mind having Texas their ownselves—taking their whole division with them, leaving the 12-team SEC wondering if maybe they should swallow the ACC whole and then we're basically left with three conferences and Kansas is totally screwed. Got all that? Because what we're really talking about here is the end of Division I sports as we know it. Dan Wetzel has an amazing column today that not only explains why the Big 12 is fucked, but also how Big 10 head honcho Jim Delany is a crazy supervillain that played the BCS and TV networks and the other commissioners to ensure his conference remained the financial behemoth that it is. See, he's not against a football playoff. He's against a football playoff that isn't completely dominated by his schools. By destroying rival conferences first, he can solidify the Big Ten's TV advantage (the biggest source of revenue in college sports), then bring on the playoff—which will soon have a lot fewer players expecting a cut. But what kind of world will we be in when three (maybe four) mega conferences control the overwhelming majority of all college sports revenue? People always say that we should admit that big time college football is a professional sport, but for any school outside of those top gangs it soon won't be. They will all struggle to make a dime. Right now, non-BCS schools cannot compete for the TV dollars needed to have a truly successful program. And their piece of the pie is about to shrink even more. We'll have a de facto new division, above the old I-A and I-AA levels, that will completely change the way we think about the sports we follow. The reason the NCAA has rules about paying players and dishing out benefits isn't just about amateurism. It's also about creating a level-playing field where a podunk school in Idaho has just as much chance to field a championship football team as the state-funded giants in Austin or the wealthy, private schools in Los Angeles. That's already an illusion, I suppose, but the new super-conferences will kill that idea forever. Even if these changes eventually lead to a college football playoff, it's clear that there will be major winners and major losers and the losers need not apply. This could all happen in a day, or it could not happen at all. And maybe it won't change anything all that much. It's all just cheering for laundry, right? But for now I find myself in the unenviable position of hoping that Notre Dame (sigh) will do the right thing: Join the Big10, 11, or 12, prevent the decimation of the real Big 12, and maybe we get a playoff some other way. One that finds a way to include the have-nots as well as the haves. If not, then Tom Izzo might as well go to the Cavs, because the idea that tradition and loyalty mean anything compared to money is a delusion that isn't worth holding on to anymore.